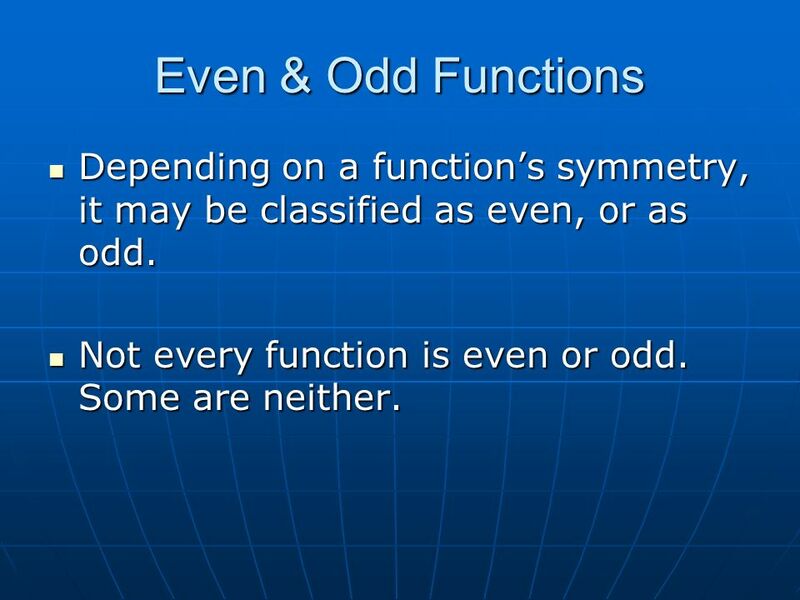 Even & Odd Functions Depending on a functions symmetry, it may be classified as even, or as odd. Depending on a functions symmetry, it may be classified. 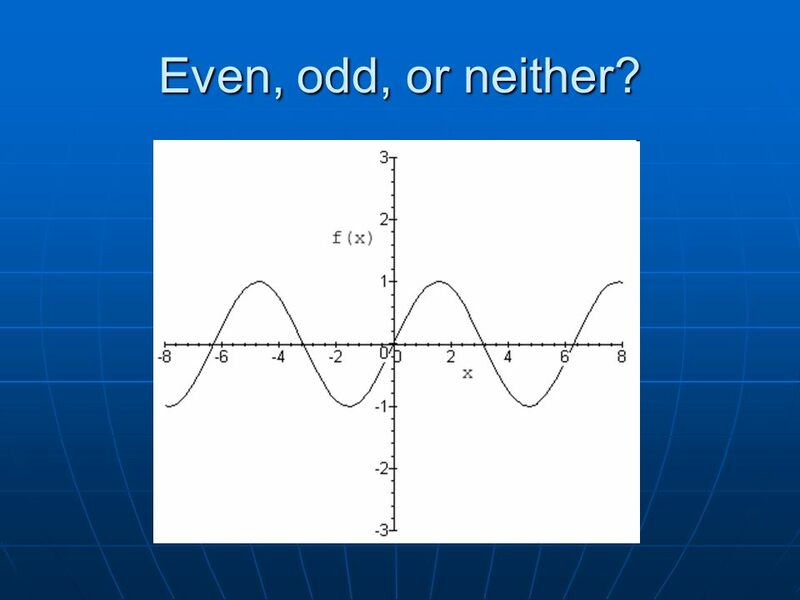 1 Even & Odd Functions Depending on a functions symmetry, it may be classified as even, or as odd. 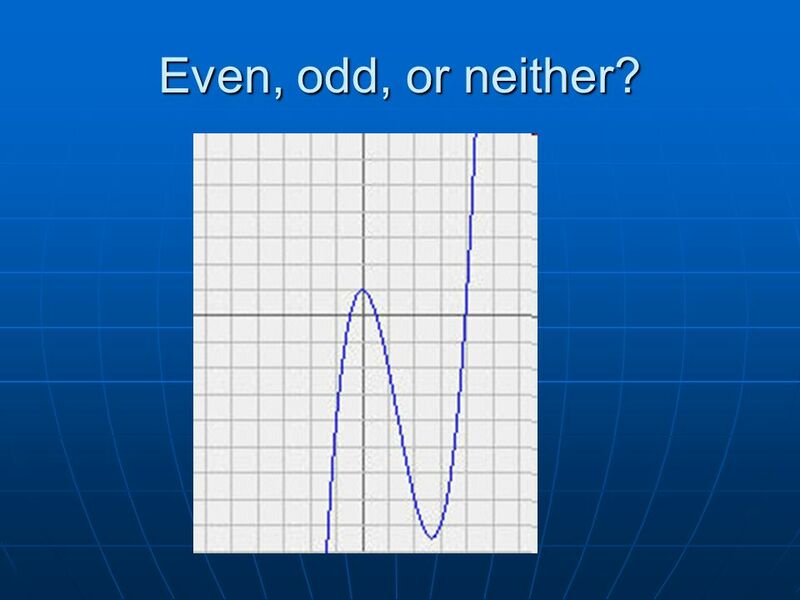 Depending on a functions symmetry, it may be classified as even, or as odd. 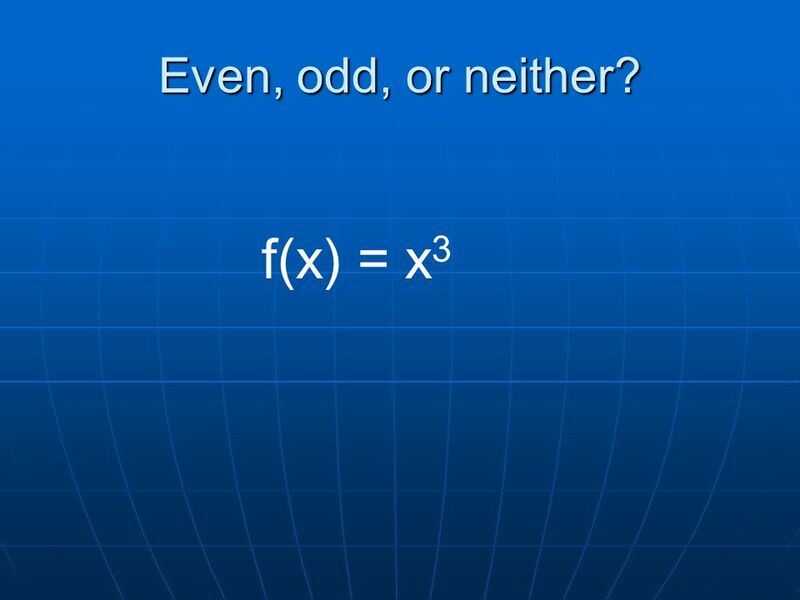 Not every function is even or odd. Some are neither. 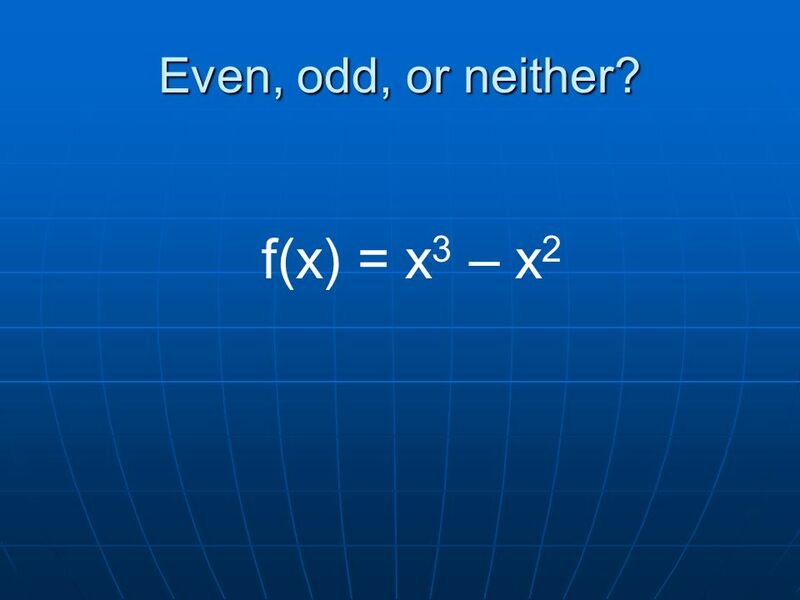 Not every function is even or odd. Some are neither. 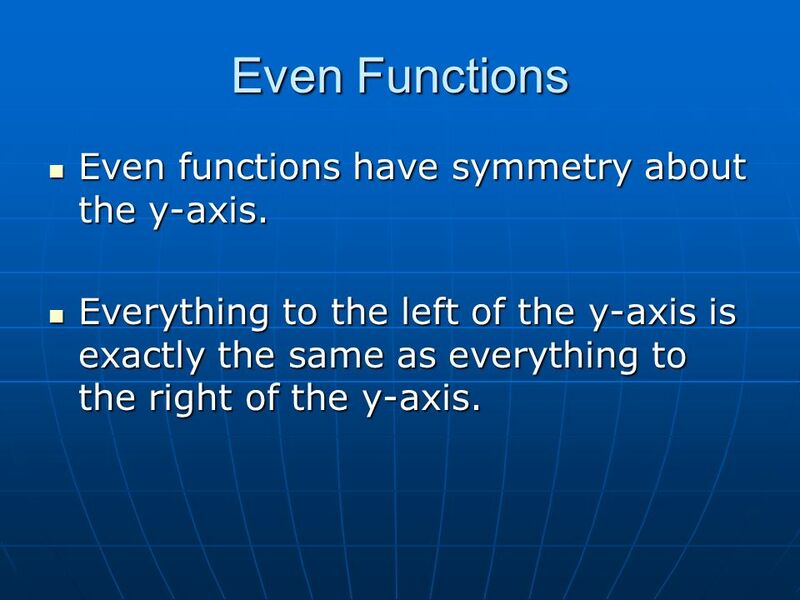 2 Even Functions Even functions have symmetry about the y-axis. 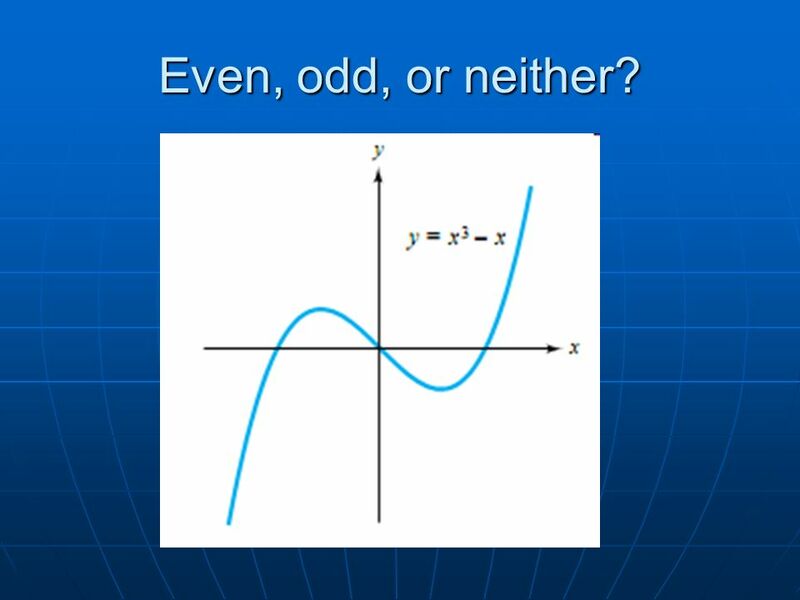 Even functions have symmetry about the y-axis. Everything to the left of the y-axis is exactly the same as everything to the right of the y-axis. Everything to the left of the y-axis is exactly the same as everything to the right of the y-axis. 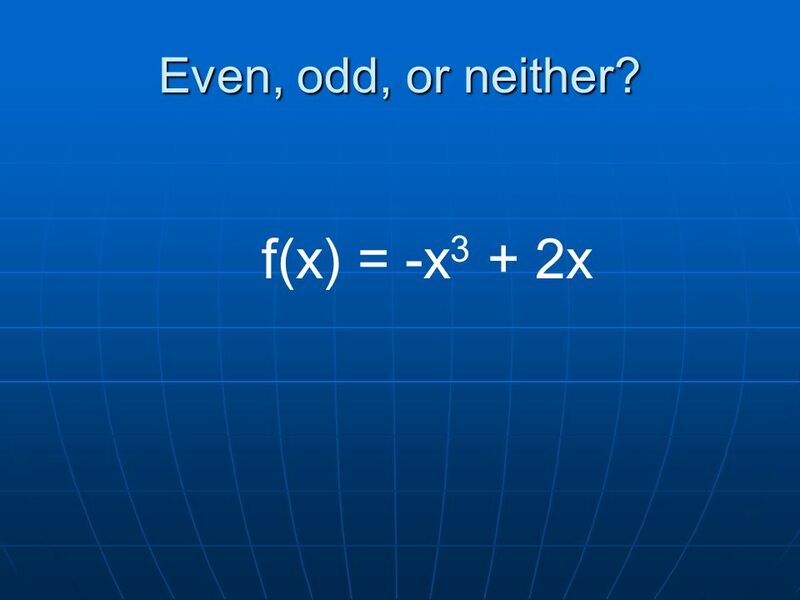 5 Even Functions Lets look at f(x) = x 2. Lets look at f(x) = x 2. Create a table of values using opposite inputs (x=1, x=-1 and x=2, x=-2). InputxOutput f(x) = x 2 1 1 2 = 1 (-1) 2 = 1 2 2 2 = 4 -2 (-2) 2 = 4 Opposite inputs (1, -1) produced outputs that were equal (1 and 1). 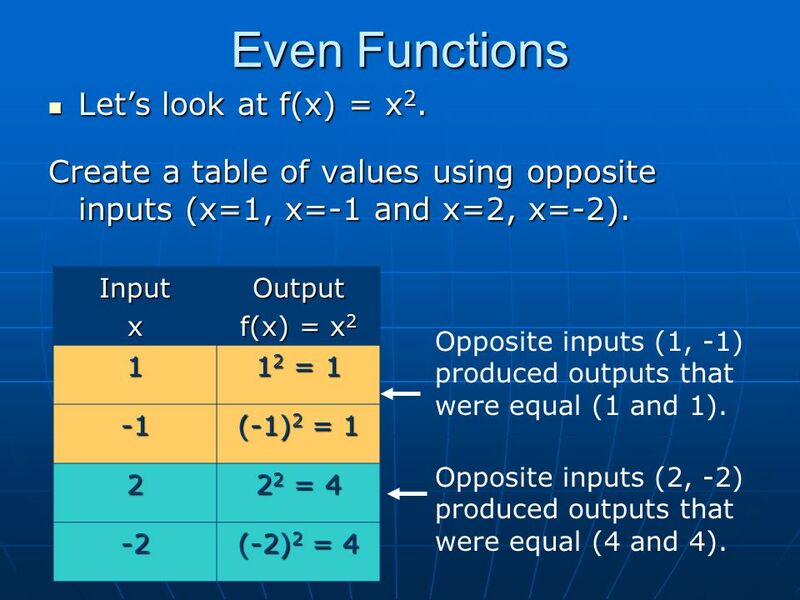 Opposite inputs (2, -2) produced outputs that were equal (4 and 4). 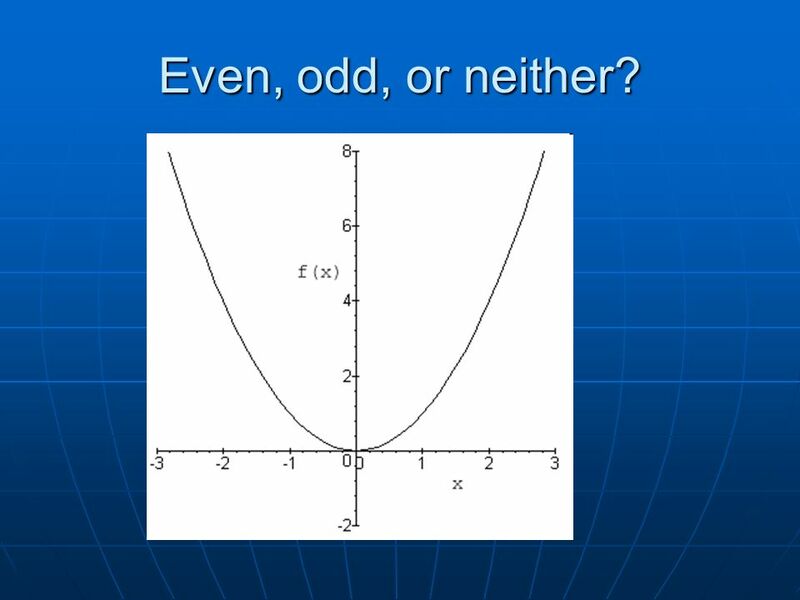 6 Odd Functions Odd functions have rotational symmetry. 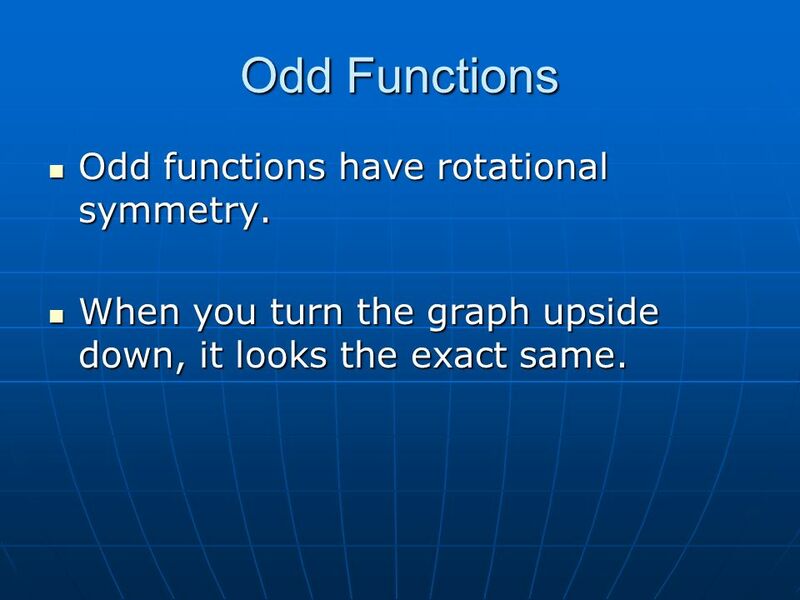 Odd functions have rotational symmetry. When you turn the graph upside down, it looks the exact same. When you turn the graph upside down, it looks the exact same. 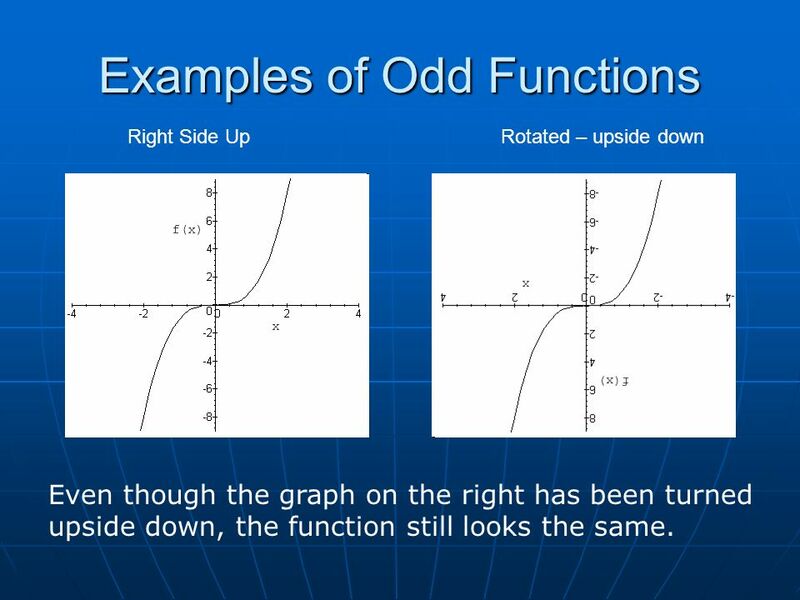 7 Examples of Odd Functions Right Side Up Rotated – upside down Even though the graph on the right has been turned upside down, the function still looks the same. 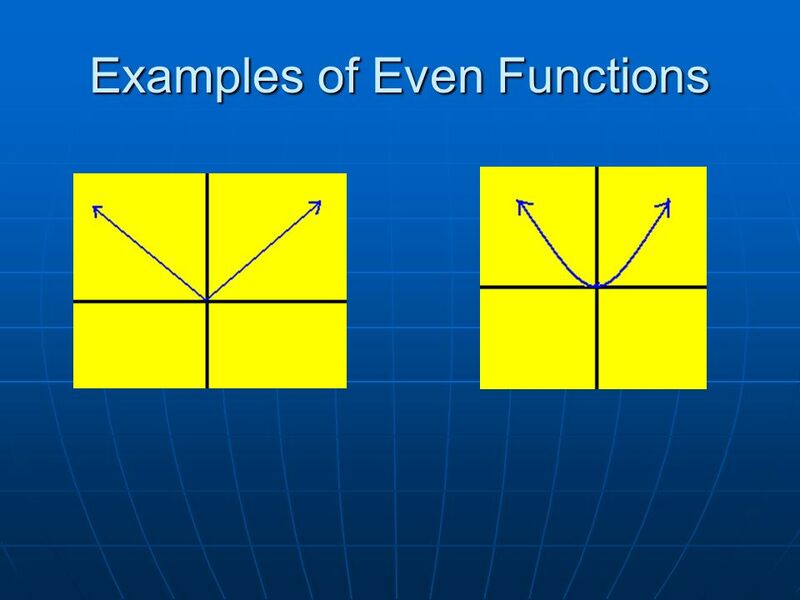 9 Even Functions Lets look at f(x) = x 3. Lets look at f(x) = x 3. Create a table of values using opposite inputs (x=1, x=-1 and x=2, x=-2). InputxOutput f(x) = x 3 1 1 3 = 1 (-1) 3 = -1 2 2 3 = 8 -2 (-2) 3 = -8 Opposite inputs (1, -1) produced outputs that are opposite (1 and -1). Opposite inputs (2, -2) produced outputs that are opposite (8 and -8). 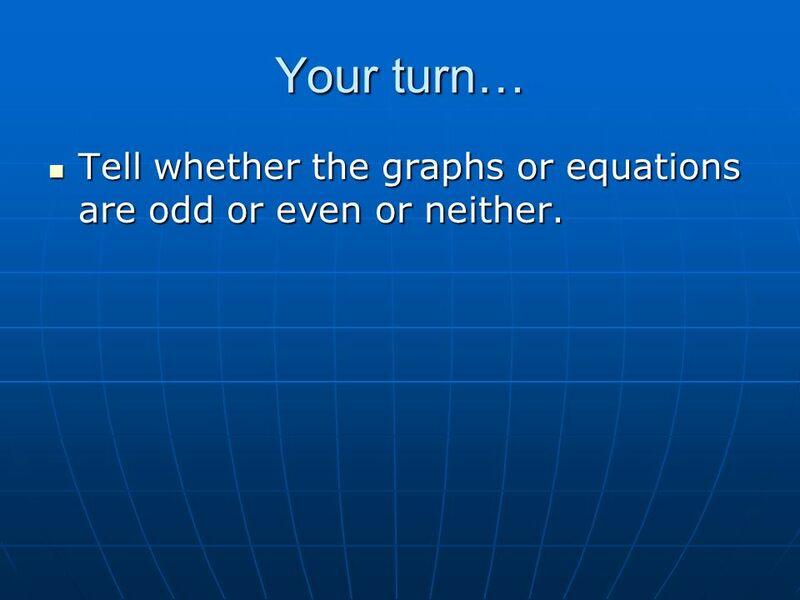 10 Your turn… Tell whether the graphs or equations are odd or even or neither. 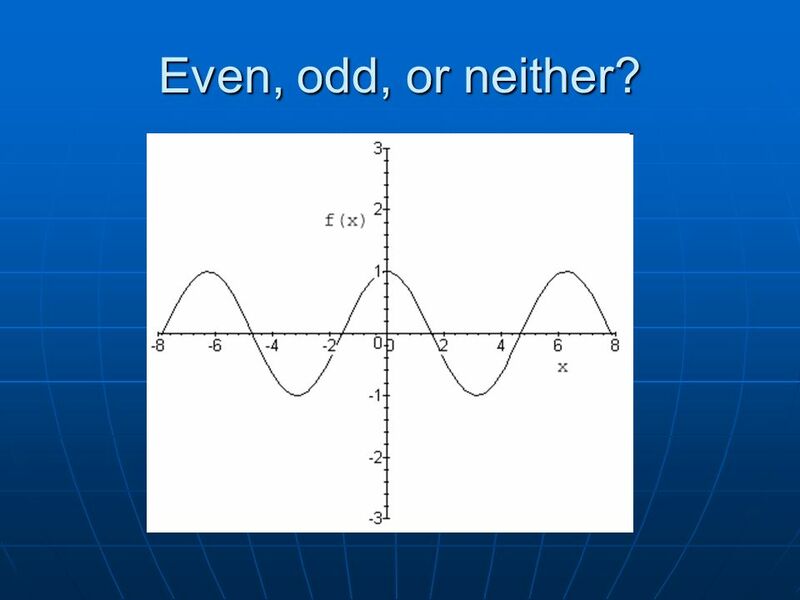 Tell whether the graphs or equations are odd or even or neither. 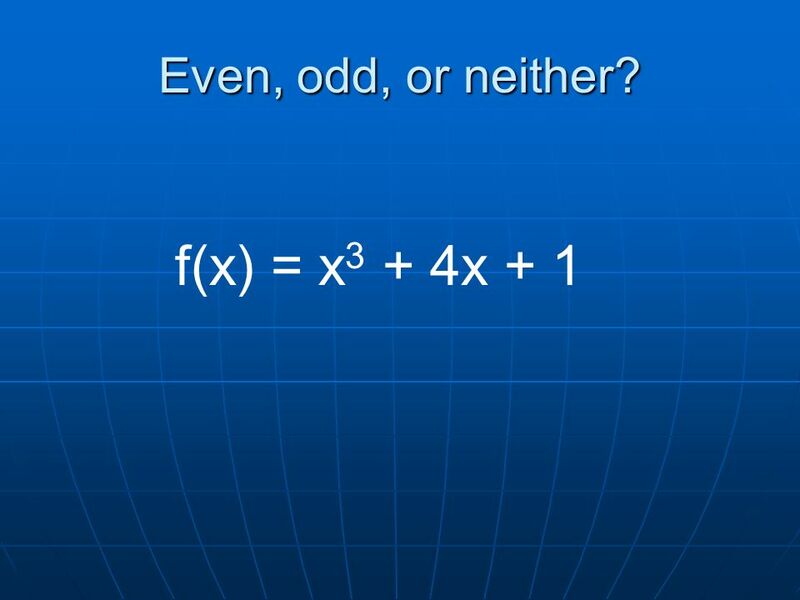 11 Even, odd, or neither? 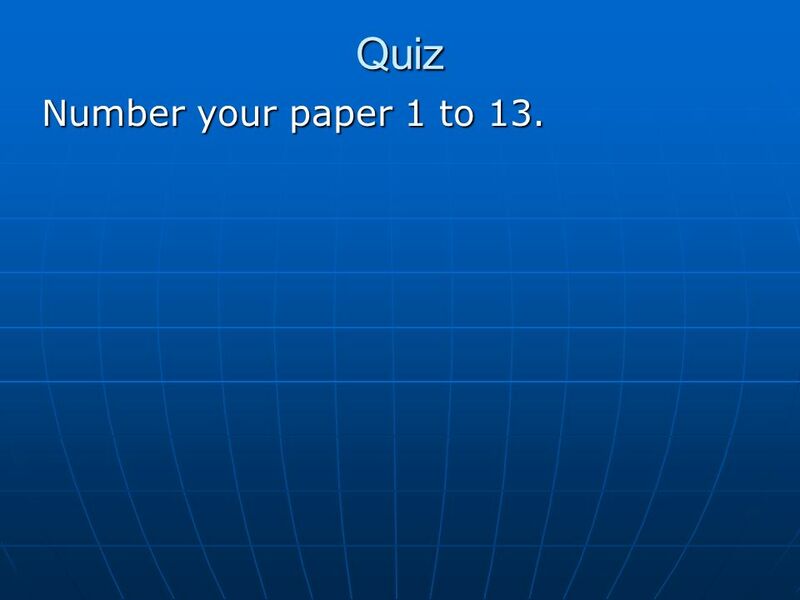 24 Quiz Number your paper 1 to 13. 25 Even, odd, or neither? 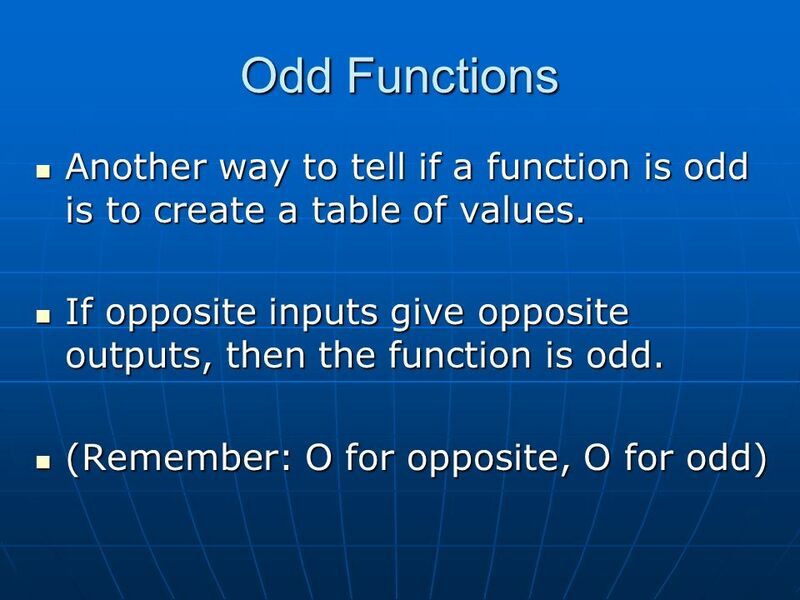 Download ppt "Even & Odd Functions Depending on a functions symmetry, it may be classified as even, or as odd. Depending on a functions symmetry, it may be classified." Make sure you have book and working calculator EVERY day!!! 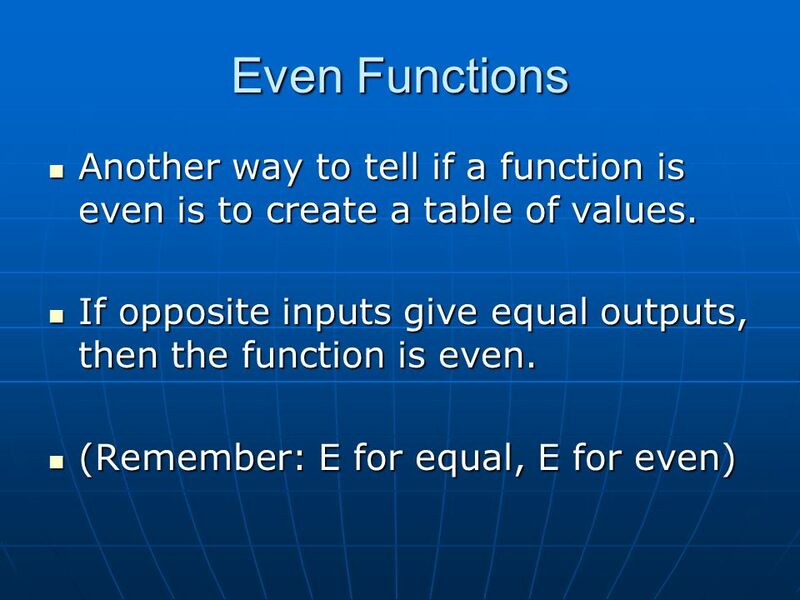 Functions II Odd and Even Functions By Mr Porter. 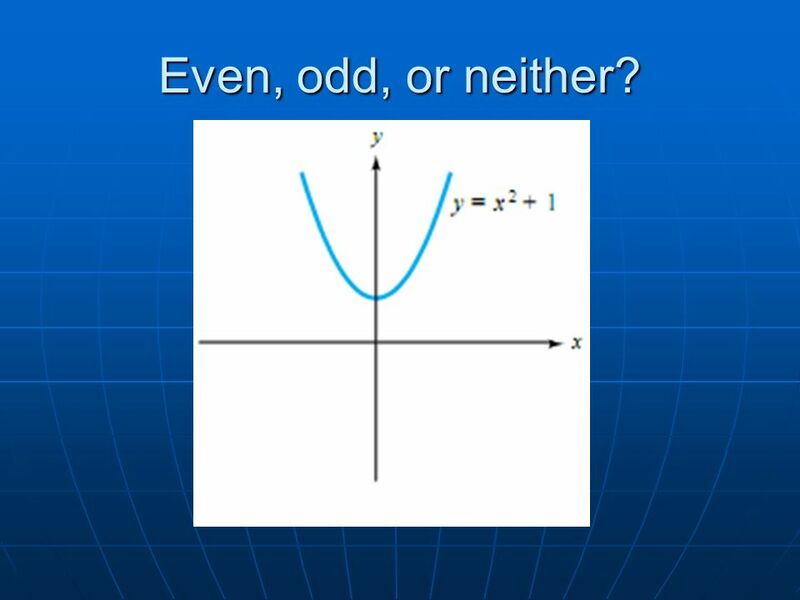 6.2 Graphing Parabolas Function Language and Graphing with a Table. Bell Work	1/20/15 Write in slope-intercept form the equation of the line passing through the given point and PERPENDICULAR to the given line. Hope your Weekend was Relaxing!  Pick up notes from the front table  Pick up new assignment log  Begin your Entry Ticket  Tonight’s HW: o Pg. 133 #2,3. 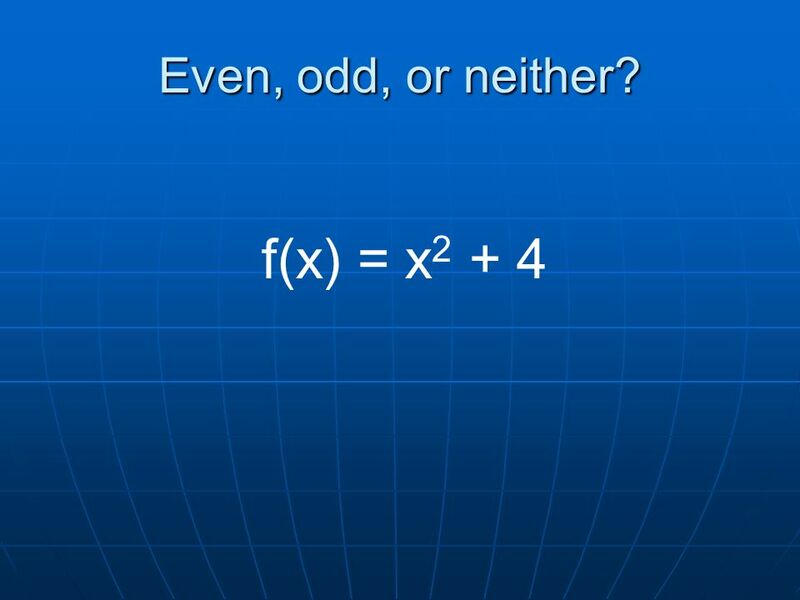 Finding the Roots of a Polynomial. 2 Real Roots and 2 Complex Roots because it only has 2 x-intercepts but has 4 “turns” Classifying the Roots of a Polynomial. Function: Definition A function is a correspondence from a first set, called the domain, to a second set, called the range, such that each element in the. Slopes of Lines Chapter 3-3. INTRO TO LOG FUNCTIONS. Sect 5.10 on p. 451 The assumption.